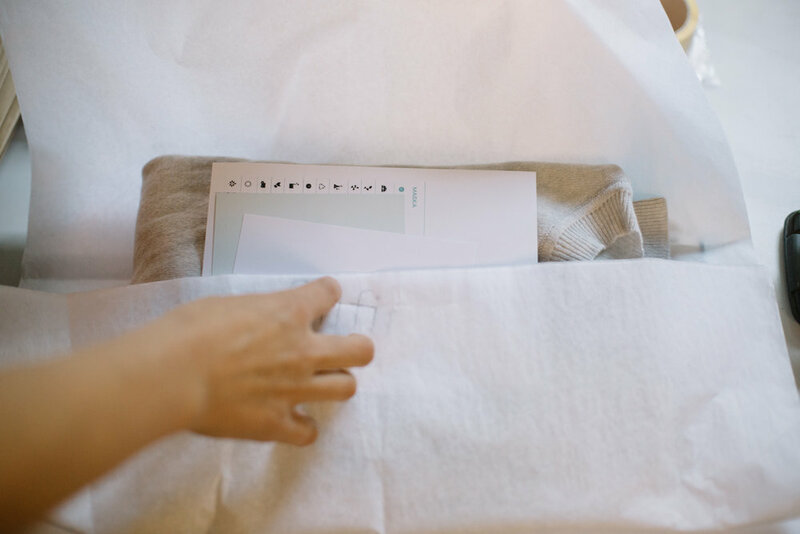 "What is most impactful is to drastically reduce the amount of clothes we buy." For me the meaning of sustainable fashion really goes back to the word 'sustain' - how can we create a way of consuming fashion that sustains our environment, as well as the people and animals who live in it? The word also stands for any effort to take us back into an economic model that is self sustainable and not depleting our resources. Why did you feel like the sustainable fashion market needed a new solution? I started my research back in October 2016 because I was frustrated with the experience of buying sustainable fashion - either it didn't fit my style or I felt that it was overpriced. It seemed like there was no hassle free way to shop clothes without contradicting my values. 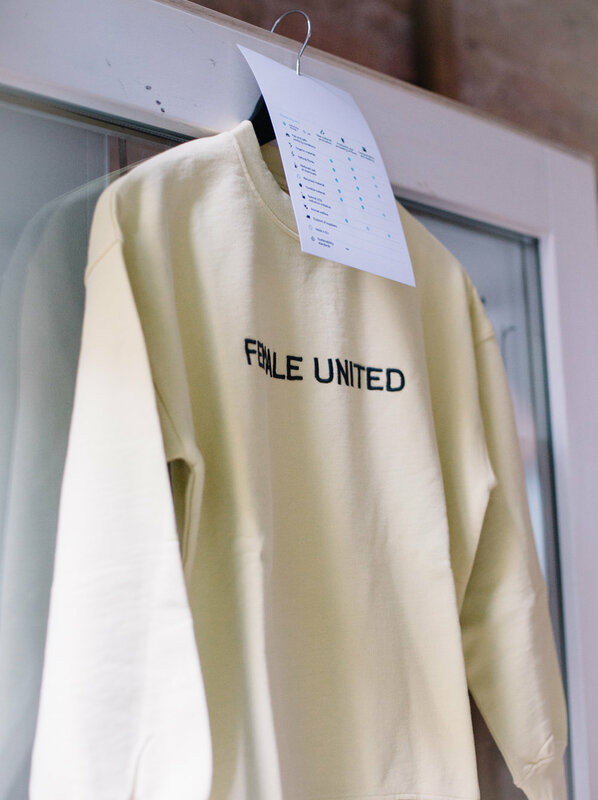 Limited FEMALE UNITED jumper with sustainability chart. Hilaria and Nikita (Aufgabe Null) at Silfir.com and Friends launch party. How did you come up with the concept for Silfir.com? I did interviews with other women in their late 20ies and 30ies to understand their relationship to sustainable fashion and realised that almost everyone I talked to felt the same as I did: They wanted to buy more sustainably but felt like there was no solution that combined style and a justifiable price point. Doing several workshops and researching the environmental impact of fashion I then came to the conclusion that what is most impactful is to drastically reduce the amount of clothes we buy, that's how I came up with our repair and recycle circular economy proposition. I also recently published my first article on Medium about my approach to changing the fashion industry. I would love to hear your thoughts on it. How does the repair & recycle service actually work? For now we offer our customers to send their clothes back for a repair service for which we use the original yarn, buttons etc to ensure they can be reinstated to look like new. If a garment is worn out we offer to recycle it and give customers a voucher towards their next purchase. It would be amazing to take this proposition to the next level and offer people a full maintenance service for their wardrobe. I believe both us as the retailer as well as the consumer need to work towards the same goal of maintaining clothes for a longer period of time and selling quality over quantity. Our repair offering fosters this mindset for everyone involved. How do you choose the pieces and brands you offer? I researched sustainable brands for almost two years before making the initial selection of the brands to collaborate with. It was an organic process but ultimately I wanted to create an everyday wardrobe for a modern and urban woman who subscribes to a minimalist style and quality. Everything is made of innovative natural materials. We have affordable everyday basics as well as ‘special basics’ that enhance an everyday look like our silk bomber jackets. Going through the process of selecting brands to work with I realised that every brand has a different approach to sustainability, to create visibility for our customers we added a chart to every product description which clearly illustrates the brands approach to material production, processing and retailing. This visibility means that people can choose for themselves which approach they want to support. Jikal wearing her new 'can you pull it off dress'. Do you have your own designs? For now we are only working with selected European brands from which we handpick our styles. Because it is our goal to fully enable our customers to live a positive and sustainable, lifestyle we are however secretly working on the ultimate capsule outfit. Stay tuned. Where do you see Silfir.com in 5 years? People are ready for a world where products are designed in a way that is fun, engaging AND sustainable. To bring this vision to life we would like to expand our repair and recycle offering and combine it with the ultimate capsule outfit. In this way everyone involved is incentivised to work towards reducing the environmental impact of clothes as well as reducing waste. I think circular economic models are the ultimate way to create the world we want to live in. Your sustainable fashion recommendations for us? I love this TED talk on sustainable fashion and of course Fashion Revolution is on the top of my list. Other than that some sustainable fashion blogs I would like to recommend are Fair Knallt, Green Me Berlin, Fashion Fika, At Least Blog and Hey Lila Hey. *Hannah gave us a 10€ voucher to pass on to you :) Just use the code sustainablefashionmatterz.